Quantity discounts available as follows: 3 to 5 units: $38, 6 to 8 units: $36, 9 plus units: $34. Collastin has many uses. It is valuable adjunct for those dealing with immune system issues. It is valuable for those who have joint function issues. It is valuable for those who merely wish to do all they can to postpone the consequences of aging. Achy stiff joints are one of the worst things about growing old. But, due to the discovery of Collastin and Collastin Support, it is possible in many cases to completely avoid this unhappy consequence. First, it appears to act as a natural lubricant or surfactant. In the latter case, it has not only a dissolving or thinning action, but it makes other nutrients easier to absorb. Collastin makes the joints move more freely and muscles glide more smoothly over other muscles, bursas and bones; and at the same time, it softens these tissues, making them more pliable. It makes blood vessels more slippery and more able to easily contract and expand. Secondly, Collastin appears to function as a kind of immune system modulator. It appears to mediate inflammatory processes, favoring the good prostaglandin’s and inhibiting the bad prostaglandin’s. It also seems to function as a natural leukotriene inhibitor.Normally, leukotrienes are sent out to combat invaders, but sometimes leukotrienes continue to be manufactured long after their usefulness is over. Inhibiting the harmful action of leukotriens is an important part of what Collastin does. Cetyl Myristoleate is a type of oil (fatty acid ester) that is naturally produced within the bodies of rare species of mice. 40 years ago, Harry Diehl (the discoverer) worked at job in which he injected toxic substances into small animals and rodents in order to cause the animal to get autoimmune diseases such as arthritis. Then other researchers would evaluate the effectiveness of various potential cures to see which worked best. However, some of the mice (those that naturally produced cetyl myristoleate) would not become diseased. It was also discovered that humans who supplemented with cetyl myristoleate would acquire a resistance to autoimmune disease. Unfortunately, as a naturally occuring, unpatentable substance, it was uninteresting to pharmaceutical companies, so it remained unknown for 25 years until Harry Diehl as an older man managed to get it written up in the Journal of Pharmaceutical Sciences, (after using it when he began to deal with arthritis himself in his later years). Collastin contains cetyl myristoleate and other companion fatty acid esters and fatty acids that work together even better than cetyl myristoleate does by itself. Over 50 iterations of the Collastin formula have been made in the process of improving the beneficial results of Collastin. It is now far superior to any other cetyl myristoleate on the market. A companion to Collastin called Collastin Support is also recommended. The major ingredients in Collastin Support include a mixture of Cox-2 enzyme inhibiting plant materials called Enzyrest (see below) and Glucosamine Hydrochloride. 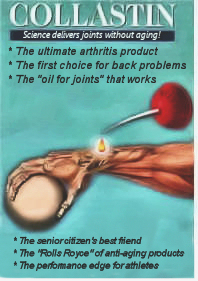 These help maintain/rebuild joint integrity and reduce inflammation in joints, etc. Taken together these products are remarkably effective the discomfort in joints that accompanies growing old for three basic reasons. First, they function as a super lubricant for the joints, as well as arteries, muscles, tendons and other body tissues. Secondly, they function as a natural immune system modulator and seem to help normalize hyper autoimmune responses. And lastly, they help to mediate inflammatory processes. From bedridden to active, Collastin and Collastin Support may actually amaze you with increased flexibility and freedom from stiffness and discomfort. Collastin is one of those products where the body’s tissues must reach a “loading dosage” before the product is effective at reducing stiffness. It can take up to 70 days to reach this loading threshold for some people (depends on body size and liver function) at the suggested rate of 4 capsules per day. Because of the 70 day loading period... we recommend planning on three months of using Collastin. If you are not satisfied with your results, you may return to us the empty bottles and request a refund of the product (minus shipping). The Collastin Soft Gels (Red Color) need to be taken on an empty stomach which means no food for two hours before and one hour afterwards. The Collastin Support Capsules (Yellow Color) can be taken with or without food. The simplest way is to take all seven capsules (4 red, 3 yellow) together and be done for the day. This could be done upon arising in the morning, for instance. Collastin needs to achieve a “loading dosage” before it begins to exert it’s nourishing and protective effect upon the body. Typically, this means 60 days of product use before any good effects are noticed. Just be patient and consistent. The revolutionary compound - Collastin , as found in our product, is a highly bioavailable proprietary blend comprised of multiple fatty acid esters produced using a unique micro-fractionation process. A proprietary process employing fractional distillation results in a unique blend of cetyl fatty acid esters including 40% Cetyl Myristoleate. This important compound was first discovered in the early 1970’s by researcher Harry W. Diehl, Ph.D. during his 40 years on staff at the National Institute of Health. However, it wasn’t offered to the public until after his retirement. Collastin contain other fatty acid esters including cetyl myristate which Dr. Diehl now considers a synergistic component necessary for maximum effectiveness. The Collastin complex is further Soft-Gel encapsulated to aid in emulsification and to provide enhanced bioavailability. If you have seen the movie Lorenzo’s Oil, (starring Nick Folate, Susan Sarandon and Peter Ustinov) then you understand that the human body produces special oils (fatty acids) that are essential to a correctly functioning body. In the boy Lorenzo’s case, his body didn’t make one of these oils (because of a genetic defect). Therefore the cell membranes of his nervous system were rapidly deteriorating and, as a result, young Lorenzo would within a few months die a very distressing death. The movie is about how his parents persevered in searching for a way to artificially produce and provide this special oil to their son. As this movie pointed out, oils are vital to the correct functioning of the body. The case we make is that Cetyl Miristoleate is a special oil that can enhance the performance of the body, defend against the disease process and keep your body younger. Some years ago, a researcher discovered a species of white mice that was totally immune to arthritis and autoimmune disease. They found that this immunity was due to a particular oil that their bodies produced that protected them. This oil (fatty acid ester) is called Cetyl Myristoleate. It was found that a particular formulation that included this oil provided similar autoimmune protective benefits to humans... at least it did so with a majority of 500 test subjects. The long and short of the story is that our Collastin product contains Cetyl Myristoleate and other synergistic oils, obtained, thankfully from sources other than little white mice. Since the ingredients are all naturally occurring there is little financial incentive for drug companies to spend money on testing and scientifically quantifying the potential of these ingredients in overcoming autoimmune diseases such as lupus, MS and arthritis. Nonetheless, numerous people have reported the favorable results they have had from this product, especially in terms of having more supple, joints and less inflammation of all types. We call Collastin WD40 for joints. Collastin’s companion product, Collastin Support, combines plant botanicals that help reduce inflammation and a superior Glucosamine hydrochloride that helps the body to repair damaged cartilage and increase joint synovial fluid. According to the Center for Advanced Medicine’s cofounder, Dr. Marc Drucker, these two products help produce the most significant, long-lasting relief of joint stiffness of any products he has ever seen. And so now there really is help for individuals who find that they feel stiff with lessened mobility. Additionally, when we feel more supple, we have better posture, we stand up straight and tall, feeling better and more energetic! It’s only natural. Feeling good on the inside means looking better on the outside. When our limbs feel strong and free for a nice long walk or a night of dancing, the joy of living shows in our faces. Indeed, we look and feel our best when we are active. Remember: What takes place on the inside becomes evident on the outside! The ingredients found synergistically blended in this formulation have undergone years of extensive testing for effectiveness. With Collastin it truly is possible to feel better than you did at 18 and appreciate life more! We invite you to become supple and flexible - inside and out - just as your family and friends remember you! In fact, we should all be able to bounce out of bed, touch our toes, and bend over to pick up a dime with ease and agility. Live life to the fullest! Daily life should not be filled with physical stress and strain. Play sports with your children and grandchildren. Say goodbye to stiffness and reduced freedom of movement. What once was lost can be regained. Improved suppleness and flexibility can be yours. You must take control of your own health. Take responsibility for your own body and how you look and feel each day with the perfect product and ingredients which work in concert to bring out the very best in you!